My Life Being Visually Impaired | What Can YOU Do? Editors’ Note: This guest blog post is re-posted with the permission of CDE member Special Olympics. Hello, my name is Ben Collins, and here is my story. I have been working at Special Olympics International in Washington, D.C. for 26 years, and I work in the Branding, Communications and Content Department. I sort and deliver the mail for the department, conduct donor calls two times a week to thank donors for supporting our programs, lead interviews and office tours, type Braille nametags, act as the department’s co-budget officer, maintain the press kits, participate in Capitol Hill Day to get Members of Congress to support Special Olympics, lead the team meetings and send calendar invites. I use three types of special needs equipment on my desk every day. The first is the visual tech helping me do the mail every day here at my desk. It’s like a giant magnifier. It magnifies the print, and it works because I can see the shadows. The next thing I use is the computer. It’s called the JAWS system. When people hear about the JAWS, they think it is a shark, but it’s a computer program for people who are visually impaired. The last thing on my desk is the Braille typewriter. It has six keys, and I make Braille nametags for everyone in the office. It helps me find their desks. When I was in school, I had a vision teacher and a mobility teacher. When I left school, my first job was working at the button factory, called A Major Production. It started out as a temp position but led to a full-time job. I was there for two and a half years. This year, I went to the Special Olympics USA National Games in Seattle, Washington. I participated in the sport of bocce for Team Maryland. We played on the turf instead of grass. I won two silver medals and a bronze medal. For me, I have to listen to the voices to tell me where the polena is. The official stands over the polena and he or she asks, “Can you hear me?” If I can’t hear him or her, I ask him or her to say it again. Then I roll the ball. I usually roll the bocce ball against the wall because it is good strategy. I have been a Special Olympics Maryland athlete for 38 years, and the USA National Games was my first time competing outside the state of Maryland. I wish that I could talk to everyone who just learned they have Retina Pigmentosa or other visual impairments to let them know that life’s an obstacle course, but you can get around the obstacle course. It’s hard to be patient, but I have a good, full life, and you can do anything when you put your mind to it! Watch a video with Ben and read his interview with ESPN contributor, Ryan Hoff. 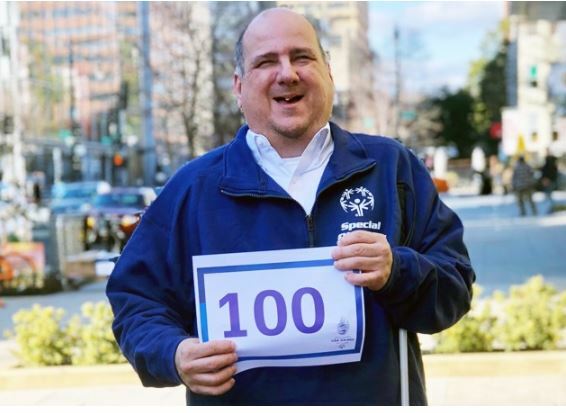 Ben Collins is an employee at Special Olympics International in Washington, D.C.